Compact and convenient, the Eco Mini is an overnight charger for AA or AAA Rechargeable Batteries. The Eco Mini comes with 2 x AA Hybrio Ready To Use Batteries. 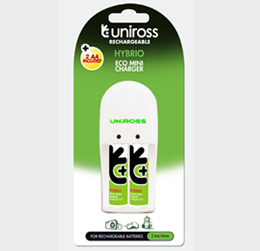 Charging time is approximately 13 hours* and is supplied with 2 x AA 2100mAh Hybrio Batteries. Fully charged & Ready to use. New "LD" Technology means your Hybrio batteries keep their charge for up to 1 year after charging. Can be charged 100’s of times. Ideal for use in any battery powered device. Contact us nowAsk a question or want extra info, we are here to help!